A running event that gives runners from Cyprus and abroad the opportunity to end their running year in perfect conditions. The course is challenging for the Marathon Half Marathon taking athletes through the main streets of the town and out to the most iconic Cape Greco Natural Park, while it remains fast and mostly flat for the 10k and 5k course. Opening the Christmas season of the Municipality of Ayia Napa, the Fun Run offers people the opportunity to run or walk in festive costumes and contribute to charity which is the main cause of this part of the event. Finishers will have the opportunity to experience the lighting up of the central square Christmas tree and the party around it in the finish area. Ayia Napa Marathon also gives you the opportunity run and raise funds for charity. Participants can click “REGISTER” and select the Charity Registration option in any of the events. This way they can raise money for causes of their choice. A category is valid if at least 5 participants have registered for that category. All Finishers in the Marathon, Half Marathon 10Km Road Race and 5Km Road Race will receive a Finishers Medal. All Finishers in the Marathon and Half Marathon will receive a free Finisher’s T-Shirt. Finishers in 10Km Road Race and 5Km Road Race will receive a Finisher’s T-Shirt which can be purchased at an additional cost of €15 during registration. The first three male and female of each age group will receive a Medal during the Prize Awarding Ceremony. You can register online at: Online Registration until 25/11/2018 for the Marathon, Half Marathon 10Km Road race and 5Km Road race. And at the venue (Ayia Napa square) on Saturday 1st of December see schedule. The online entry fee is €35 for the Marathon, €25 for the Half Marathon, €15 for the 10Km and 5Km road race and €5 for the Fun run/walk. Where do I get my race number? Race Pack collection will take place at the race venue (Ayia Napa square) on Saturday 1st of December. 08:00 until one hour before the event you have registered. 08:00-15:00 Fun run / Walk registration. Can I transfer between events? No, you cannot transfer between event. No, we cannot facilitate any changes of names on entries. Refunds will not be issued for any reason. What does my entry fee to Ayia Napa marathon include? – Water, first aid stations and toilets. Where is my Timing Chip? Your Timing Chip is built into the back of your race number. Don’t tamper with the chip and wear your number on the front of your top where race officials can see it. Where is the Race Start and Finish Line? The start and finish line are located at Ayia Napa square. What facilities are available at the start and finish line? Is there parking at the start and finish line? There is no parking along the course. The course is fully closed to traffic from 10am. There are lots of car parks in Ayia Napa center which are a short walk to the start/finish area. Is the race being timed? Yes, the Marathon, Half Marathon, 10Km Road race and the 5Km Road race will be chip timed, from start line to finish line. The results will be available online as soon as possible after the event and top places will be announced on race day during the awards ceremony. Are there Water stations/First Aid? Yes, there will be Water stations and First Aid facilities at 5, 10, 15, 20, 25, 35Km and the start/ finish line. What is the cut off time? 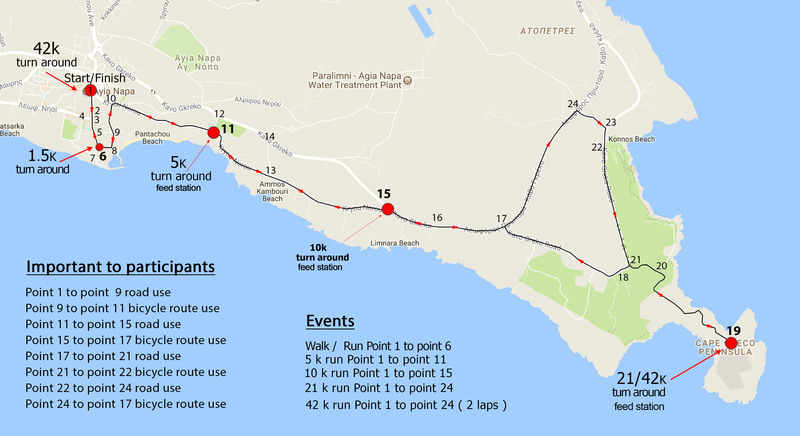 Ayia Napa Marathon does not have a cut off time, but our road closure finishes at 16:00 pm. At this point barriers and signs must be taken down. Participants must then progress to the finish line using the pedestrian ways. It is allowed but we strongly recommend avoiding it because It is unsafe to wear headphones while running. Yes. Only in the Fun run/walk. How can I contact the race organisers? Please email us below and we will get back to you as soon as we can. Napa Marathon also gives you the opportunity run and raise funds for charity. Participants can click “REGISTER” and select the Charity Registration option in any of the events. This way they can raise money for causes of their choice. 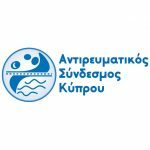 The registration for Ayia Napa Marathon (All events) is extended until Wednesday 28/11/2018.